Veteran lawyer and prominent social media defender of Pres. Rody Duterte on social media, Atty. Bruce Rivera made some rebuttal against the fake news being spread by the Dilawans supporters on social media criticizing the senatorial bets of Pres. Duterte and endorsing the Otso Diretso senatorial bets. Atty. Bruce Rivera warned his supporters to be careful with the fake news being spread allegedly by a certain member of the Catholic Clergy. 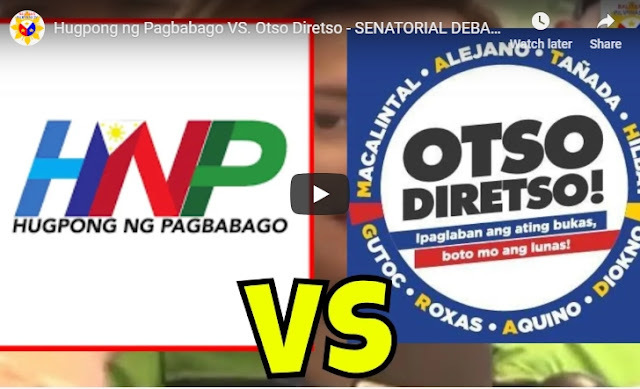 The alleged "madre" tried to instill fears among the religious groups not to vote for all Duterte aligned senatorial bets and promote the senatorial bets of Otso Diretso. According to the fake news being spread by the supporters of Otso Diretso "if the admin's Hugpong were able to win 9 seats out of 12 this May, they would be able to have a veritable supermajority in Senate of minimum seventeen (17) Senators. Atty. Rivera rebukes all the statements made by the supporters of the Otso Diretso senatorial bets. “If the Admin's Hugpong were able to win 9 (nine seats) out of 12 this May, they would be able to have a veritable supermajority in the Senate of a minimum seventeen (17) Senators. Seventeen Senators out of twenty-four (17 of 24) is a majority that will be two-thirds plus one and technically, the magic number required for the Senate to EVEN OVERRIDE any veto by the President. AKO: Kaloka ang theory. Inaassume na faithful ang mga senador to rally behind party lines. Kilala niyo ba ang mga Senador pag nasa posisyon na? May sariling keme na yan. Sariling echus na yan. 1. Legislate in full what Duterte wished done including many ways to amend the Constitution in every way, foremost would be amending the 1987 Constitution from Presidential to Federal form. AKO: Anong masama sa federalism, teh? Gusto niyo talaga mananatili tayo sa sistemang ito na nuknukan ng baluktot. Promise ni PRD ang federalism. And he fulfills promises. Hindi katulad nung dati mong amo, pasagasa lang sa tren, di pa matupad. Bato, Imee and all those beholden to Duterte will elect the Devil as Senate President if Duterte liked it. AKO: Ay tanga!!! We impeached Leni, di makalagpas sa House dahil madami siyang silent friends dun. At kahit pa umabot sa Senate yan, hindi sigurado makukuha ang 2/3 majority to impeach. At anong masama kung ma-impeach si Leni???? Nagbabasa ba kayo ng balita. 3. Ratify a new defense treaty with China where we will come under the thumb of China for the next 99 years. AKO: Really? Hindi kailangan ng defense treaty kasi if any state attacks the Philippines, China is within striking distance to launch a defense kasi sila ay sobrang lapit to justify a preemptive strike. And if any state attacks China, di na natin kailangan tumulong. Good luck sa aatake. 4. Rescind thru a Senate Bill the Mutual Defense Treaty (MDF) with the United States to make way for China to become the only powerful ally of the new Federalist Philippines. AKO: Sa palagay nila ganun katanga si PRD na ilagay ang lahat ng itlog sa China. Minsan, dahil sa desperation, the scenario raised lack sophistication, nakakapikon sa kawalan ng finesse. China to mine and utilize, on our behalf, the resources in the WPS so that "the entire South China Sea will live in peace & harmony". AKO: China palagi ang panakot. Sana di nakakalimutan ng mga ito na si PNoy ang may secret treaties with China na hindi alam ng publiko and never refuted. At magbasa kayo ng balita na hindi nakapikit ang mata. China is not the most favored nation ng Pinas. Only 2% of all the foreign loans are made with China. We have more trade with Japan and the US. Aral din po. AKO: Naknang, nakakapikon na itong sumulat nito. I inaakala na super tanga si PRD at super convincing ang China na payag tayo sa lahat. 7. They may even try to expel Sen. Delima using their numerical superiority for "acts unbecoming as a Senator" for her trumped up drug charges that no RTC Judge wants to handle. in support of the main plan that Sara must become President in 2022 and she, Gloria Arroyo must sit as Prime Minister when the shift to Federalism becomes final and complete. AKO: Talaga??? And PRD totally trusts GMA to entrust her with the position as Little President like an Executive Secretary. You know what happened fo Erap. Galing humibla ng kwento ang mokong na ito. Galing galing mag tamang hinala. Sige, shabu pa!!! AKO: There you have it! Sa dami ng kuda, sinabi lang niya ang iboto sa mga pangit at hwag iboto ang HNP. Hoy, mangampanya kayo gamit ang qualification at huwag niyong takutin ang mga Pinoy para manalo! Patas lang po.